Durden Outdoor is excited to have partnered with AEG Entertainment to promote the one and only Willie Nelson & Family in the Durden Digital Network! AEG Entertainment came to us looking for a digital billboard blitz in the Dothan market to let the wiregrass area know that the country music legend is coming to town. 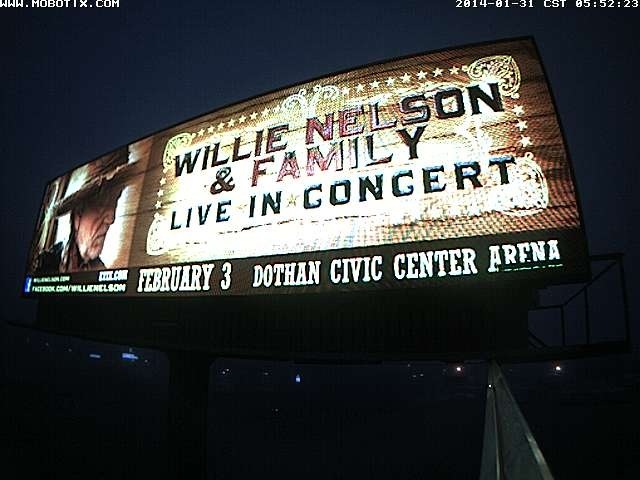 You can see Willie LIVE tonight at the Dothan Civic Center! Limited tickets are still available and may be purchased at the Dothan Civic Center box office. http://www.durdenoutdoor.com/wp-content/uploads/2016/06/DUR-Footer-Logo.png 0 0 Amy Riddle http://www.durdenoutdoor.com/wp-content/uploads/2016/06/DUR-Footer-Logo.png Amy Riddle2014-02-03 19:14:432014-02-03 19:14:43Willie Nelson LIVE tonight!